Vada's Blog Stamp Inks and Paper : Challenge Time Again. For Gingersnaps #136 Glorious Greens. From K&Company Die-Cuts I picked the Green Backed bird for the focal point. 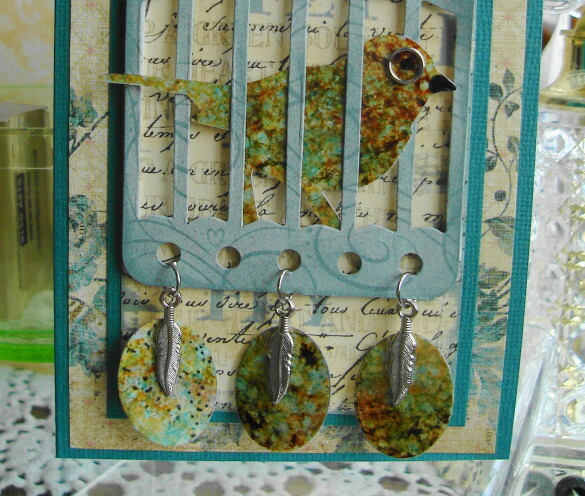 Sizzix embossing folder was chalked with Versa Magic Hint of Pesto, Backgound was stamped with Hero Arts Music Notes in Pumice Stone distress ink. Keep A Green Bough, was a stamp from Oxford Impressions but it was far too large, so I typed the verse. Teal Card is just for fun. I am not adding this to the challenge. 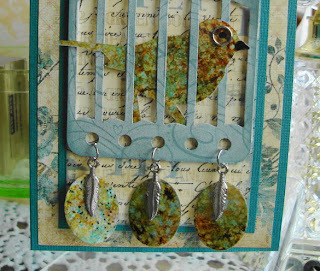 Working with Acetate and Alcohol Inks I cut the Bird and Eggs with dies. 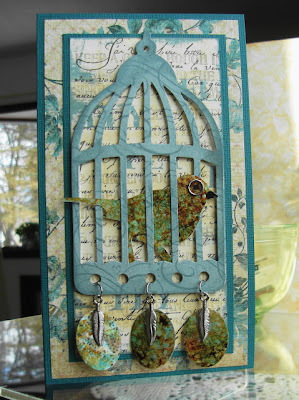 The Bird and it’s cage is from Tim Holtz. The Eggs are Spellbinders Oval Dies. Two Hero Arts stamps were used. Plus the FLY stamp is from TAC. Thanks for visiting today, hope you will enjoy my Green cards and stop into Gingersnaps and join this challenge. Wonderful cards! The green one is my favourite. 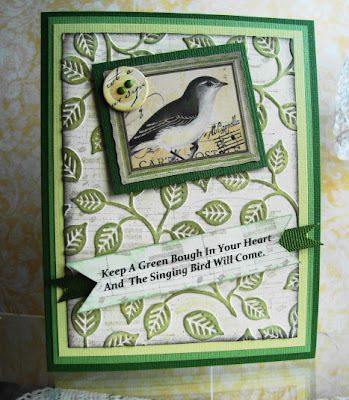 What a fab green card- love the background and the bird image is lovely! The bird cage is done beautifully as well! Love the texture on the inked background! the leaves look great! Two more beauties making me long for spring and warmer weather! These are beautiful! I especially love your AI bird and eggs... very cool, Vada! 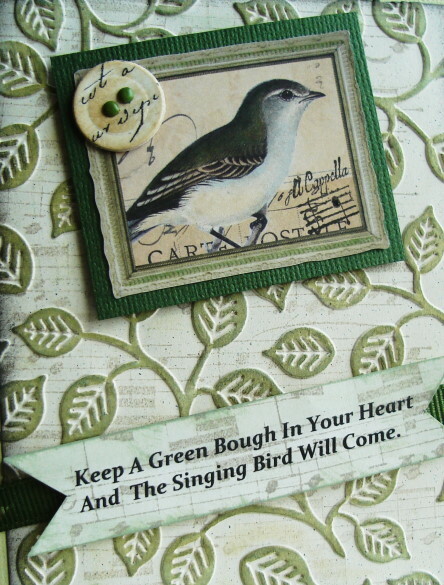 lovely green card and sentiment for the Gingersnap Creations challenge! Beautiful bird cage tag!